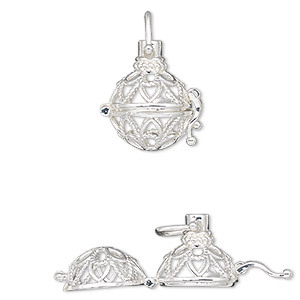 Pendant, imitation rhodium-finished "pewter" (zinc-based alloy), 25x19mm double-sided snowflake bead cage, fits up to 8mm bead. Sold individually. Item Number: H20-B8066FN Have a question about this item? 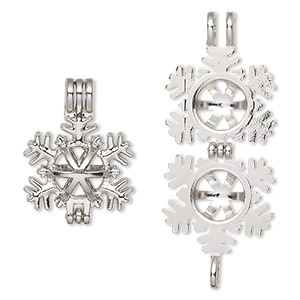 This snowflake bead cage pendant is customizable and reusable. Fill with beads, pearls, essential oil bases, etc. that are up to 8mm in size or Swarovski® crystal SS39 faceted rivoli (1122) chatons, then place on stringing material to secure. 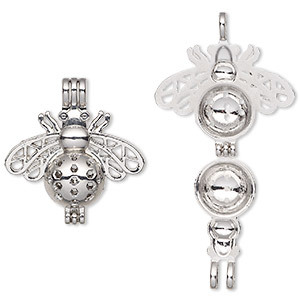 Pendant, imitation rhodium-finished "pewter" (zinc-based alloy), 29x28mm double-sided bee bead cage, fits up to 8mm bead. Sold individually. 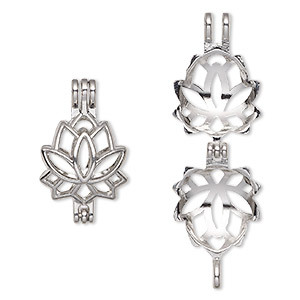 Pendant, imitation rhodium-finished "pewter" (zinc-based alloy), 26.5x16mm double-sided lotus bead cage with 12mm rivoli setting, fits up to 8mm bead. Sold individually. 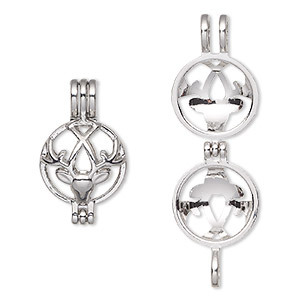 Pendant, imitation rhodium-finished "pewter" (zinc-based alloy), 26x16mm double-sided round bead cage with deer design, fits up to 8mm bead. Sold individually. 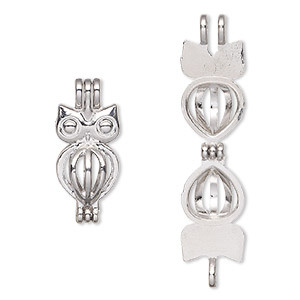 Pendant, imitation rhodium-finished "pewter" (zinc-based alloy), 26x11.5mm double-sided owl bead cage, fits up to 6mm bead. Sold individually. 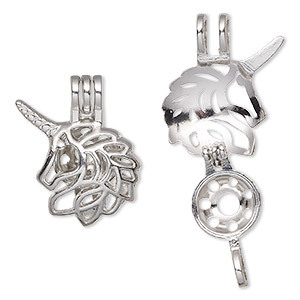 Pendant, imitation rhodium-finished "pewter" (zinc-based alloy), 26x22mm single-sided unicorn bead cage, fits up to 8mm bead. Sold individually. 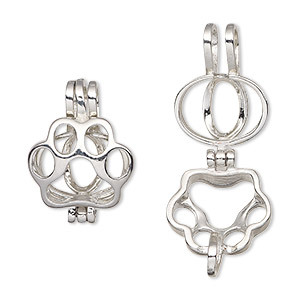 Pendant, imitation rhodium-finished "pewter" (zinc-based alloy), 21x15mm single-sided paw bead cage, fits up to 8mm bead. Sold individually. 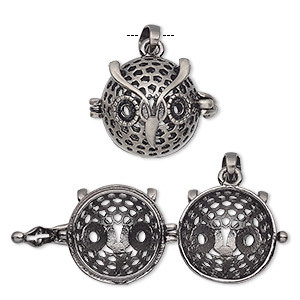 Drop, antique silver-finished "pewter" (zinc-based alloy), 18x17mm round bead cage with owl design and safety latch, (2) SS16 flat back settings, fits up to 14mm bead. Sold individually. 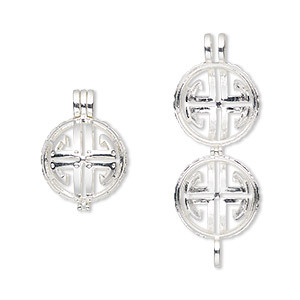 Drop, silver-finished "pewter" (zinc-based alloy), 28x21mm round bead cage with cutout design, fits up to 17mm bead. Sold individually. 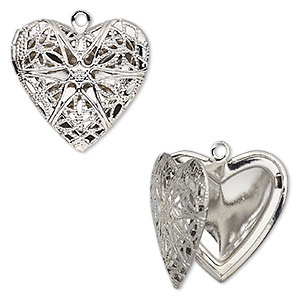 Drop, silver-finished brass, 25.5x24.5mm single-sided hinged heart bead cage with cutout flower. Sold individually.